In August 2012 I published a blog post Why You Didn’t Get The Interview, which received a good bit of attention from readers and was republished a few times (most notably by Lifehacker). Of course one article could not list every possible explanation that an employer or recruiter might use to discard a résumé, so I decided to revisit the topic once again. This is not intended to be a comprehensive list, but rather an addendum to the previous post that may help explain a lack of response to your job search. No submittal content – Online applications often consist of several fields and check boxes that don’t always give job seekers an opportunity to express interest or differentiate themselves. However, when you send a résumé via email or are provided some space within an online application to craft a custom message, you are foolish not to take advantage. Simply sending a résumé without any supporting information about your experience or interest in the job comes across as lazy or aloof, and can give the appearance that a job seeker is simply blasting résumés indiscriminately (perhaps even in an automated fashion). SOLUTION: Tell the employer at least one or two things that drew your attention to the job and company. Multiple applications to the same employer for vastly different roles – Sometimes I will open my inbox and find an email from a job seeker about one job that could possibly be a fit, and then find another four or five emails from the same applicant for other jobs that are not remotely connected to the candidate’s experience. This applicant may have received some attention if he/she only sent the one semi-targeted application, but the additional blind stabs have too many negative implications. It typically signifies either a lack of self-awareness regarding qualifications, immaturity, or desperation. SOLUTION: Before submitting your résumé, check several of the company’s listings to make sure that you are applying for the one or two jobs that best fit your experience and goals. If you have a strong desire to work for a specific employer, sending a targeted application to one or two listings is much more effective than spamming your résumé to all of their vacant slots. Many small red flags – My original article last year referenced 14 fairly obvious reasons that job seekers are not interviewed, but often it’s not that simple. Many times a résumé/application package will contain a handful of items that would not be a problem when considered individually, but when combined add up to a rejection. The recruiter or hiring manager will feel that too many special circumstances would have to occur that make the candidate’s hire unlikely. Perhaps a candidate has a slightly elevated salary expectation, requires relocation assistance, is minimally qualified, and lacks any easily identifiable positive indicators of talent or ability that stand out from others. An applicant with only one of those characteristics would likely be considered, but the aggregate picture makes it too much of a longshot. SOLUTION: There is no real fix to this. You could always try to explain what could be perceived as a red flag. For example, if you are relocating to a specific area, make it clear why you are looking in that specific market to avoid being viewed as someone open to jobs worldwide. Displaying some level of interest or passion for the employer could also help overcome objections and get you a shot. Personal reputation and your employer’s reputation – It shouldn’t surprise anyone that if you apply to firms where people either know you or are connected to those that do, a decision to interview will typically be based on how these contacts feel and talk about you. However, your employer’s reputation may also come into play here as well. If a particular company has interviewed multiple former employees of your firm without much success, chances are they will not waste time interviewing another. As a recruiter, it is fairly common for companies to tell me “Unless they are outstanding I’m not overly interested in candidates from COMPANY, as we see many and have not had any luck.” Your company’s reputation is more likely to work in your favor if you are employed by a firm known for having talent, but it seems the trend to discriminate against employees of certain shops continues. I wrote about this a bit in a past post regarding discrimination by startups against workers from large enterprises. SOLUTION: Keep your personal reputation in mind when dealing with co-workers and particularly when leaving jobs. Minimize stints at employers that have a negative reputation in your market. Inconsistency – This can be the result of discrepancies between a résumé and cover letter/application, between a résumé and LinkedIn profile, or just something fishy in the résumé itself. If you changed professions more often than Barbie (impressive list) or have travailed up the corporate ladder and come back down multiple times, your application will raise suspicions. Candidates that list titles progressing from CTO to CEO and then down to Junior Developer will be scrutinized. SOLUTION: There isn’t anything you can do to change the past, but explanations could go a long way if you left an industry to pursue a passion. Make sure all of your online profiles match your résumé details before sending applications. Try to use job titles that reflected your actual duties if you worked for a small firm and had an inflated title. Even if you were CEO or CTO of your dorm room software company, it may not be helpful to list the job that way. “Meh“ – Your qualifications and history are virtually identical to the others in the stack of résumés received. You may have met what was listed on the job spec, but so did everybody else. This is of particular importance for jobs where it is expected that most applicants will have similar qualifications, such as entry-level positions for new graduates or jobs that list highly generic specifications. SOLUTION: There has to be something different about you that you can add to give some positive spin to your candidacy. Review the requirement again and try to find an area where your background exceeds the expectation, or a specific experience you have that others probably don’t. 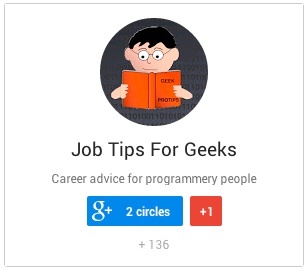 My ebook Job Tips For GEEKS: The Job Search was recently released and is available for $9.99 (reduced to $6.99 in December 2013) on iTunes, Amazon, Barnes and Noble, Google Play, and Kobo. I can provide a PDF version for sale by request.